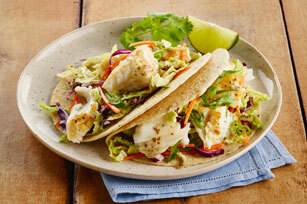 Switch up your regular taco recipe with these easy-to-make fish tacos. The Italian dressing is mixed with MIRACLE WHIP to provide all the flavouring you need for the grilled fish, coleslaw and green onion filling. These tasty tacos are sure to become the next family favourite! Mix dressing and Miracle Whip. Remove 2 Tbsp. ; brush evenly onto fish. Grill 5 min. on each side or until fish flakes easily with fork. Meanwhile, toss coleslaw blend with 2 Tbsp. of the remaining dressing mixture. Place fish in shallow dish; flake with fork. Top tortillas with fish, coleslaw, onions and remaining dressing mixture. Choosing corn tortillas helps reduce the sodium in these delicious fish tacos since the corn tortillas contain less sodium than flour tortillas.